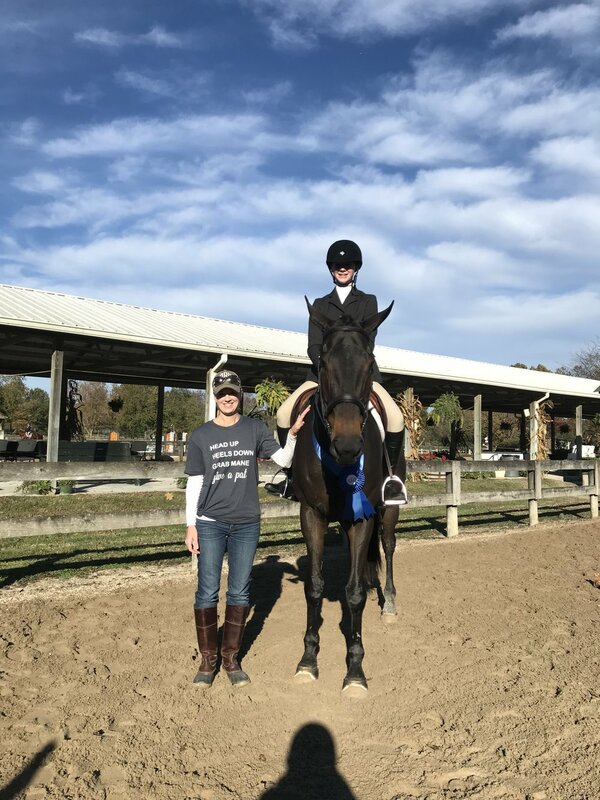 The Alabama Hunter Jumper Association hosted their annual Year End Horse Show at Brownland Farm during the first weekend of November. A cold, rainy start did not deter trainers and riders from gathering for three days of hunter, jumper, and equitation classes. AHJA members worked hard all year to be able to showcase their progress and success at our biggest show of the season. Some of our riders sporting their winnings! Guerry Force, Carlyle Brown, and Ginny Joyner made the trek to Brownland with 14 horses in tow. Amy Knowles and Kate Knowles also came early to throw in helping hands. All 14 horses—and their riders!— would exceed expectations over the course of the weekend. The AHJA Year End Show offers several money classes in each discipline, including a Welcome Class, a Mini Prix, several Hunter Derbies, and Hunter Classics. On Friday, several of our horse and rider combos made it to the second round of the AHJA $2500 Hunter Derby and came away with ribbons out of a field of 37: Lauren Velazquez and Caredan Z claimed 4th, Emma Grace Early and Wonderland took 5th, Kate Knowles and Kingsley took 6th, Lillian Reynolds and Willie won the 10th award, and Sydney Velazquez and Double Dutch claimed 11th. In the $1500 Hunter Derby on Saturday, Paloma Caine and White Tie took 12th out of 20+ competitors! Paloma would also go on to win the Long Stirrup Medal Class. Paloma, Guerry, and “George” posing with Paloma’s winning sash. Over in the jumper ring, Zoffany had a great weekend with both Ginny Joyner and owner Jessica Dallow. On Friday, Ginny piloted “Austin” to a win in the 1.0 Welcome Class. Lucy Reich and Katie Habeeb also competed, claiming the 6th and 7th awards! On Saturday, Jessica Dallow took 5th place in the 1.10 Mini Prix with two clean rounds! In the same class, Lucy Reich and Cuchino Z took 6th place. Lucy and “Chino” had solid rounds all weekend together in the 1.10 Jumpers as well! Katie Habeeb and Alto Aviator competed in the 1.0 Classic on Sunday and came out with a 7th place finish! Katie and “Lucas” also took 2nd in one of the 1.0 Jumper classes. In the hunter divisions, Emma Grace Early piloted Wonderland to champion honors in both the Schooling Hunters and the Pre-Child/Adult Hunters. Each division had nearly 20 entries—what a fantastic way to end their season! Lauren Velazquez was right on Emma Grace’s heels with Caredan Z, taking reserve champion honors in the Schooling Hunters as well. Lauren Velazquez also piloted RF Rutchspun to reserve champion in the Low Hunter division. Lillian Reynolds and Willie also had great Low Hunter trips, claiming 2nd, 6th, and 4th out of a competitive division. 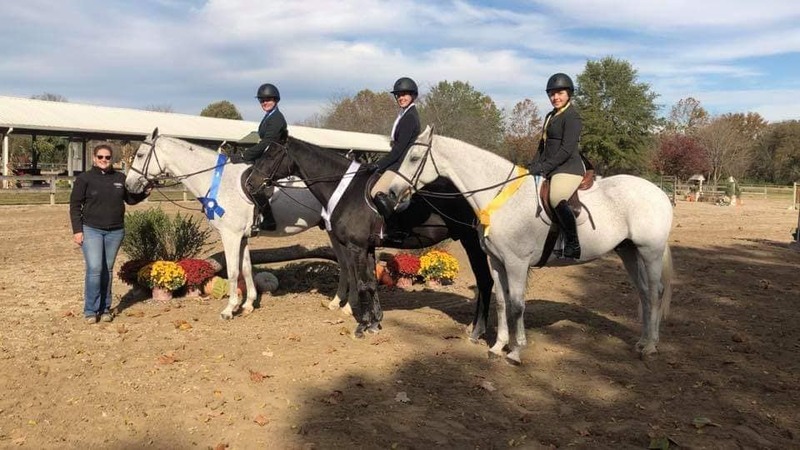 Julia King and Champlain Grey also had an incredibly successful weekend, taking home Schooling Pony champion, a win in the Dean Show Services Undersaddle Invitational, and a win in the Jr. Board Equitation Flat Challenge out of nearly 20 entries. The Undersaddle Invitational entries comprised only of winners from hunter undersaddle classes during the weekend. 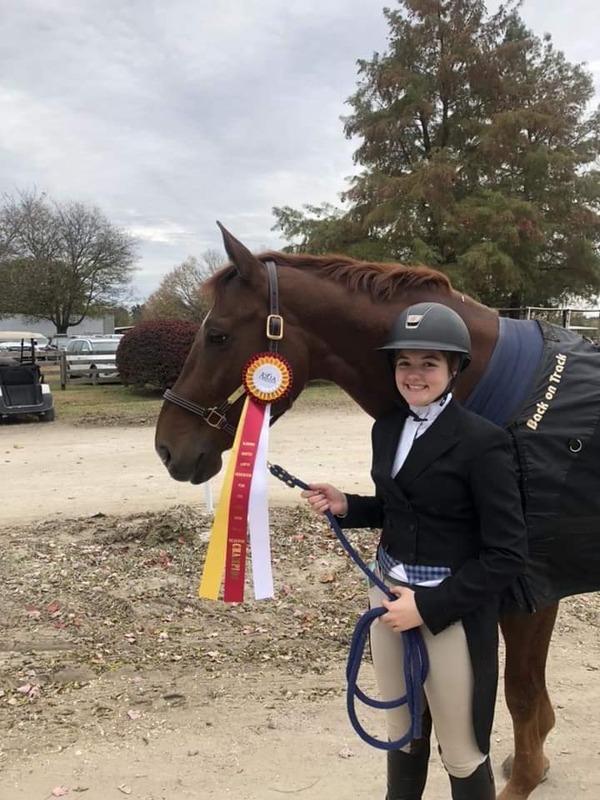 Julia says that winning the Invitational was the most exciting class of the weekend because Otis was chosen out of the best movers at the horse show. Julia has been working hard since purchasing Otis in August to learn to keep him straight and maintain a good pace. All of her hard work paid off in blue. Sarah Carson Hill also got a piece of the Jr. Board Equitation Flat Challenge, taking 8th! Sarah Carson and Benlea Rain Dancer also had nice trips in the Children’s Pony Hunters as well as a 5th place finish in the Children’s Pony Medal. Carlyle, Sarah Carson, and “Stormy” posing with Sarah Carson’s Eq Challenge ribbon. The main hunter ring also hosted a Jr. Board Equitation Flat Challenge which drew a large crowd as well. Lauren Velazquez took 7th aboard Caredan Z, Lucy Reich claimed the 6th award on Molly McCown’s Demitasse, and Lillian Reynolds took the win aboard her own Willie! Lillian’s mother Mandy wore very appropriate attire for Lillian’s equitation win! Hannah Banks and Capito had a strong last showing together in the Short Stirrup hunters, claiming several 2nd place prizes and a 5th in the Short Stirrup Medal class. Hannah and “Otto” have had a great year together. AJ Salch’s young horse Cambridge tackled the Baby Green Hunters with Carlyle Brown. “Ozzy” had good trips in good company and came away with several placings, including a 2nd in the undersaddle. He does nothing but get better and better! On Sunday, our riders tackled Medal Classes and Hunter Classics. In the $500 2’6 Hunter Classic, Lauren Velazquez and Caredan Z took top honors. Emma Grace Early and Wonderland took 3rd, with Sydney Velazquez and Double Dutch claiming 4th. Lauren and “Z” also won the Pre-Child/Adult Medal Class. Lauren says winning the medal was the most exciting class to win at the horse show for her because she’s struggled with lead changes and pace this year, but during this trip she kept Z in front of her leg and nailed all her lead changes in a course with lots of rollbacks. 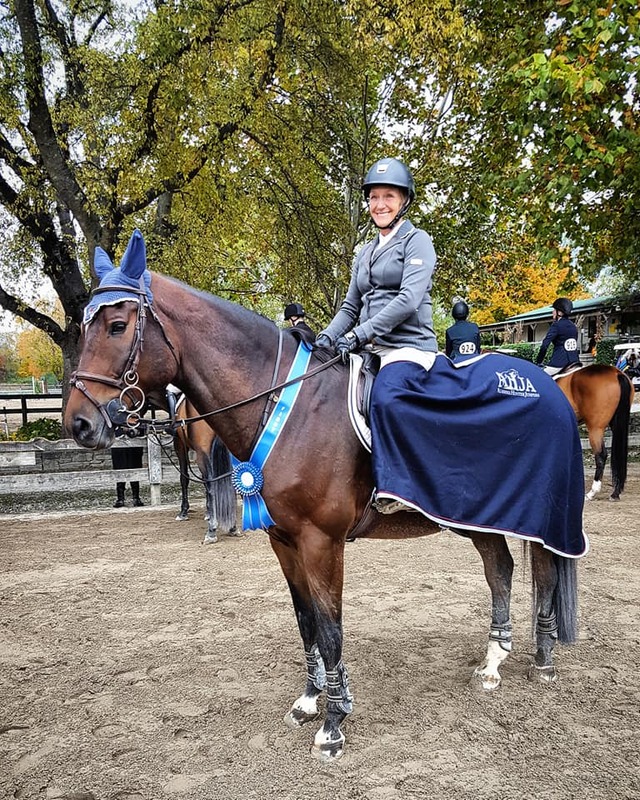 Kate Knowles and Kingsley tackled the $500 3’ Hunter Classic and came away with a 7th award. Kate and “Dax” also won the Children’s Medal! Kate had support and help from her mom Amy and sister Grace all weekend. The AHJA Show Season is a wrap for 2018! The horses will get some much-deserved down time before we start working toward our goals for 2019! Thank you to all the parents for supporting their children’s passions through rain and cold; thank you to our horses for all they do; thank you to the AHJA for putting together a fantastic show; thank you to Brownland Farm for hosting!